This entry was posted in Infrastructure, IT Pro, Learning, Microsoft, Support, Trouble Shooting, Uncategorized and tagged IIS 7.5, Support, Trouble Shooting, Web Deploy 2.1 by workinghardinit. Bookmark the permalink. Nice post. Saved me some time with researching the same issue. You’re most welcome 🙂 I appreciate the feedback. Oh man, I have wasted full 20 hours researching this IIS7 weirdness that all of the sudden it stops functioning, and without knowing much about IIS now I know ins and outs because of this stupid isssue. BUT without this post my attempts to get it working would’ve been fruitless – MANY thanks for your post!!! You’re most welcome Denis. That’s what the blog is for, to share & help were possible. I’ve spent 4 days on this and I have all these users set up fine, the only issue is with vs2010 with WB3 saying that WDeployConfigWriter is not an admin! Hi, these users and the permissions should be set up automatically. I’d post your issue in the forums on technet. You’ll have more eyes and experience over there to look at it. Good luck! Yes, this is a very helpful explanation. Where is the PowerShell script for rule management? I don’t see it in the post. It’s a quote from the referenced http://blogs.iis.net/msdeploy/archive/2011/04/05/announcing-web-deploy-2-0-refresh.aspx blog post. You’ll have to go there and to the product documentation. My post is about trouble shooting an issue, not setting up Web Deploy. Thanks for this. Deployment suddenly stopped working for my site, and your blog article saved the day! You’re most welcome. Thx for reading and happy to help. Great post! I’m very happy that I read this before throwing in too many hours troubleshooting this problem. I deploy from Powershell and all I got was this cryptic error: Restore-WDPackage failed: Microsoft.Web.Deployment.DeploymentException: (9/6/2013 2:21:58 PM) An error occurred when the request was processed on the remote computer. —> Microsoft.Web.Deployment.DeploymentException: Unable to perform the operation. Please contact your server administrator to check authorization and delegation settings. Thanks for the extra info provided and the feedback. Always happy to hear a post was helpful. Great write-up! Isolating the error was easy, but getting a solution with a detailed explanation is priceless. Thanks for a great write up. Saved me lots of troubleshooting time. way too many 😉 But this post at least tries to minimize that time 😉 Thx for reading. Sure is! Thx for reading. Your article was a life-saver. After mucking about for a day, I was about to give up on Non-Admin Deployments. Rather than changing the password for WDeployConfigWriter account, I simply checked ‘Password never expires’ and that solved my deployment failure. I also did the same for account WDeployAdmin for the sake of consistency. 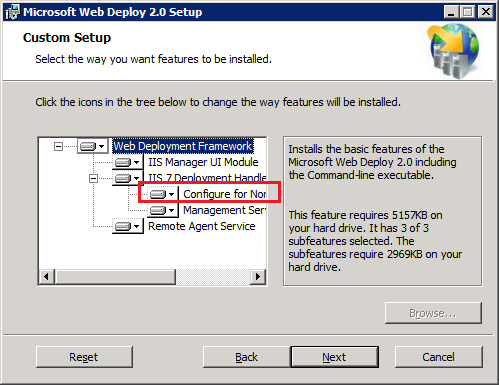 For reference, I’m using Web Deploy 3.6 against IIS 8.5 on Windows Server 2012 R2. Always happy to hear such positive feedback. Thx!